Orca Gold Intercepts Broad Minerali | Orca Gold Inc.
VANCOUVER, BRITISH COLUMBIA--(Marketwired - Jan. 9, 2018) - Orca Gold Inc. (TSX VENTURE:ORG)("Orca" or the "Company") is pleased to announce the remaining results from 2017 drilling at its Block 14 Gold Project in the Republic of the Sudan. To date, 12,449 metres (34 holes) of diamond drilling and 2,500 metres (12 holes) of reverse circulation drilling have been completed at Galat Sufar South ("GSS") as part of an ongoing 25,000-metre drilling campaign. The results from this drilling will form the basis for a new mineral resource estimate, as part of the ongoing Feasibility Study. This new estimate is in progress and will be announced in the coming weeks. Drilling will resume at the end of January with two rigs focused on additional resource development at GSS and Wadi Doum. Drilling at Wadi Doum will also target several high-grade shoots that have been identified at depth (see Company News Release on February 2, 2017). Results for previously completed drilling from the programme have been announced (see Company News Releases dated October 17, November 21 and December 14, 2017). The table below sets out results for the remaining holes that will form part of the new mineral resource. These latest results continue to confirm mineral resources within the PEA pit designs (Infill) and extend mineralization below the previous resource (Outside Resource) - See Figures in News Release. 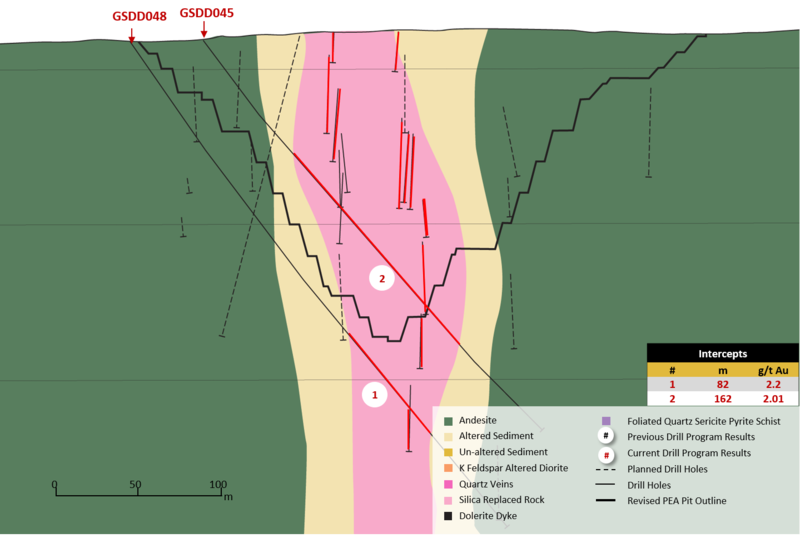 Several of the holes above tested a new geological interpretation in the East Zone (see Figure 2 in News Release), drilling perpendicular to earlier drill sections. These new holes were successful in intersecting good grade and continuity over significant widths, including 162m grading 2.01g/t in GSDD045 and 131m grading 1.73g/t in GSDD041. The solid results of these holes will assist with targeting new drilling in early 2018. 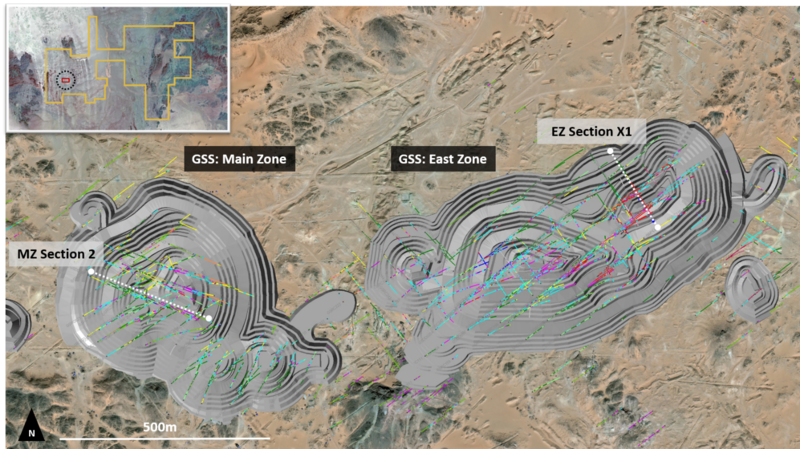 Significant results were also obtained in the Main Zone of the deposit including 48m at 2.76g/t in Hole GSDD042 and 50m grading 2.75g/t in GSDD047, which are shown in Figure 3 below and are expected to have a positive impact on the resource estimate. Rick Clark, CEO and Director of Orca, commented, "The latest holes from Block 14 continue to strongly support an expansion of the resource base. Results are with our consultants and a new resource estimate is expected shortly, which will form the basis of the Feasibility Study on track for completion in early Q2 2018. These new results are particularly significant in that a new geological interpretation was successfully tested. 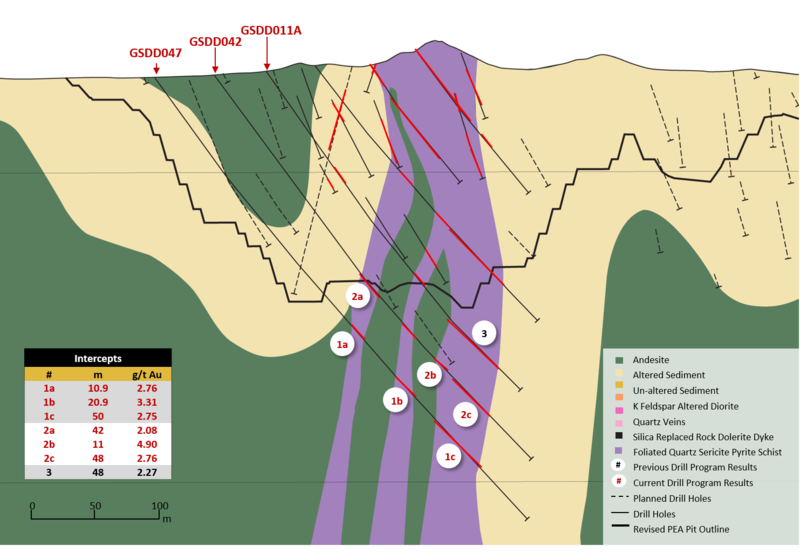 This new interpretation greatly enhances our understanding of and model development at GSS and will form the basis of continued drilling. This interpretation will also direct our regional exploration at Block 14 in 2018." Orca Gold Inc. (TSX VENTURE:ORG) is a Canadian resource company focused on exploration opportunities in Africa, where it is currently focused on its 70%-owned Block 14 Gold Project in the Republic of the Sudan. Block 14 is situated on a 2,170 km2 concession. The Company is currently conducting a Definitive Feasibility Study on the project, which is scheduled for completion in early Q2 2018. The Revised PEA of Block 14 (see News Release dated May 30, 2017), using a gold price of US$ 1,100/oz for mine design and US$ 1,200/oz for economic analysis, showed a project with in-pit mineral resources of 41.0Mt @ 1.46g/t for 1,928 Koz in the Indicated category and 3.4Mt @ 1.56g/t for 173 Koz in the Inferred category, a mill throughput of 3.4 Mtpa, and strong economics with an after-tax NPV7% of US$ 227.7 million and an IRR of 23.1%. This press release contains forward-looking information and forward-looking statements within the meaning of applicable Canadian securities laws, including statements regarding Orca's (the "Company", the "Corporation", "we" or "our") plans and expectations relating to the Block 14 project ("Block 14") in northern Sudan and the revised Preliminary Economic Assessment (the "Revised PEA") and Feasibility Study ("FS") currently being completed and/or conducted by the Corporation. These statements relate to analyses and other information that are based on forecasts of future results, estimates of amounts not yet determinable and assumptions of management. Statements concerning mineral resource estimates may also be deemed to constitute "forward-looking statements" to the extent that they involve estimates of the mineralization that will be encountered if the property is developed. The assumptions, risk and uncertainties outlined below are non-exhaustive. Should one or more of these risks and uncertainties materialize, or should underlying assumptions prove incorrect, actual results, performance or achievements of the Corporation, or industry results, may vary materially from those described in this press release. Forward-looking statements and forward-looking information are not guarantees of future performance and are based upon a number of estimates and assumptions of management at the date the statements are made including without limitation, assumptions about the following (the "Forward-Looking Factors"): future prices of gold and other metals; successful exploration, development, and production of Block 14; the timing and completion of the DFS; the timing and likelihood of a production decision; performance of contractual obligations by counterparties; operating conditions; political stability; obtaining governmental approvals and financing on time; financial projections and budgets; obtaining licenses and permits; government regulation of the Corporation's mining activities; environmental risks and expenses; market conditions; the securities market; price volatility of the Corporation's securities; currency exchange rates; foreign mining tax regimes; insurance and uninsured risks; financial projections and results; competition; availability of sufficient capital, infrastructure, equipment and labour; dependence on key personnel; dependence on outside parties; conflicts of interest; litigation; land title issues; local community issues; estimation of mineral resources; realization of mineral resources; timing and amount of estimated future production; the life of Block 14; reclamation obligations; changes in project parameters as plans continue to be evaluated; and anticipated costs and expenditures and our ability to achieve the Corporation's goals. While we consider these assumptions to be reasonable, the assumptions are inherently subject to significant business, social, economic, political, regulatory, competitive and other risks and uncertainties, and contingencies, many of which are based on factors and events that are not within the control of the Corporation and there is no assurance they will prove to be correct. In addition, a number of other factors could cause the actual results, performance or achievements of the Corporation to differ materially from any future results, performance or achievements expressed or implied by the forward-looking information, and there is no assurance that the actual results, performance or achievements of the Corporation will be consistent with them. For further details, reference is made to the risk factors discussed or referred to in the Corporation's annual and interim management's discussion and analyses on file with the Canadian securities regulatory authorities and available electronically on the SEDAR website at www.sedar.com. Although the Corporation has attempted to identify important factors that could cause actual actions, events, results, performance or achievements to differ materially from those described in forward-looking statements and forward-looking information, there may be other factors that cause actions, events, results, performance or achievements not to be as anticipated, estimated or intended. There can be no assurance that forward-looking statements or information will prove to be accurate, as actual results and future events could differ materially from those anticipated in such statements. Such forward-looking statements and information are made or given as at the date of this press release and the Corporation disclaims any intention or obligation to update or revise any forward-looking statements, whether as a result of new information, future events or otherwise, except as required under applicable securities law. The reader is cautioned not to place undue reliance on forward-looking statements or forward-looking information. View previous December 20th, 2017 Orca Gold Extends Investor Relations Agreement with Catch Advisory Group Inc.